in the refectory about three meters away. Prompted by an interior inspiration, the lad gazed attentively at the picture. Then he saw the Blessed Virgin slowly open and close Her eyes. Without attempting to explain what he saw, he told his three classmates. Frightened, they drew the attention of the Prefect and the other students. The phenomenon lasted around a quarter of an hour. Father Prefect claimed that it was an illusion and led the boys to the chapel to say the Rosary even before the prodigy had ended. 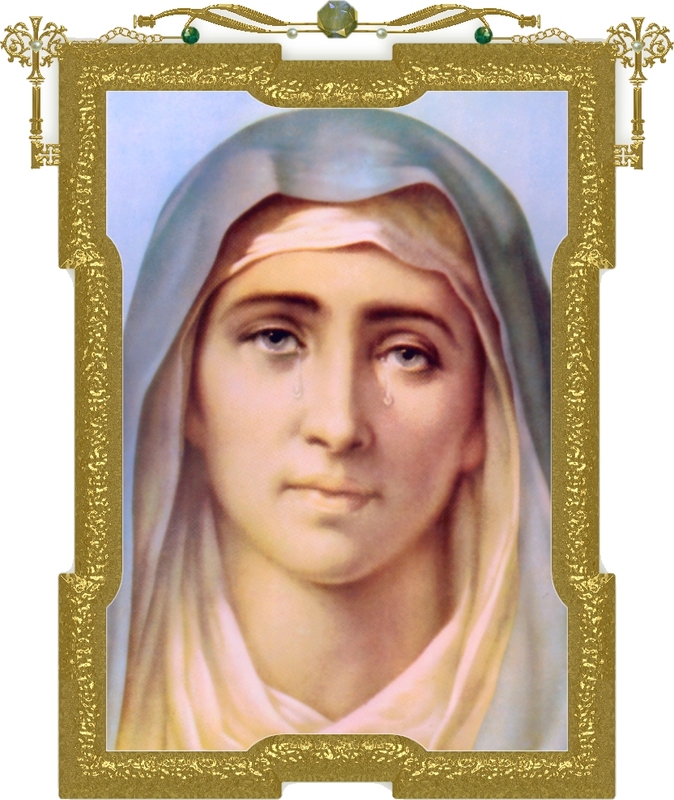 The picture in question is an oil painting of medium size (15" x 17"---38 cm x 42 cm), which represents the Mother of Sorrows holding the crown of thorns and the three nails, Her Heart pierced by seven swords. 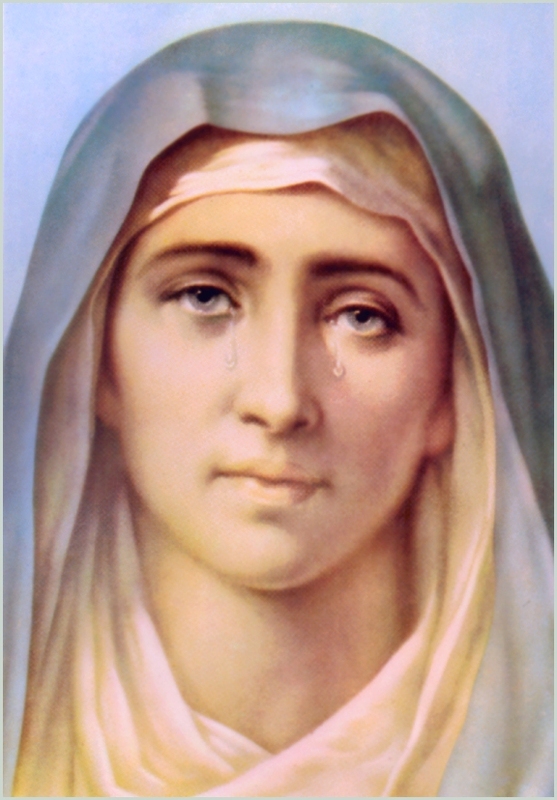 This very expressive painting inspires devotion, above all by the profound sorrow and indescribable kindness visible on the face of the Mother of God. The miracle of the animation of the Virgin's eyes occurred on several occasions. The second time it was again on behalf of the students at the academy. It took place at eight o'clock in the evening as the students were praying before the holy image, which had been moved into the chapel. After they finished the Rosary, when they came to the Litany of the Blessed Virgin, all the boys spontaneously exclaimed, "Her eyes are moving!" Such extraordinary events, observed by so many people, soon became the object of a serious examination by the Ecclesiastical Authorities. The canonical procedures were conducted with great prudence, much to the consolation of the faithful. Six weeks after the first miracle, the Vicar General of the diocese ordered the transfer of the miraculous image. It was carried in procession from the academy chapel to the adjacent Jesuit Fathers' church, where a solemn triduum was to be celebrated. It was a magnificent procession. All the communities in the city, the various associations and solidarities, the academies and schools, most of the aristocracy of the capital and over thirty thousand people took part. Such a manifestation of faith, so spontaneous and on such a grand scale, had seldom been seen in the peaceful city of Quito. In the church, the wonder was renewed several times before the crowd; many conversions followed. One remarkable conversion was that of the editor of the Tiempo, one of the most anti-religious newspapers of the period. The unbelieving journalist had joined the crowd of the faithful with the sole intention of mocking the Blessed Virgin. However, almost as soon as he saw Her open and close Her eyes, he fell to his knees and broke into tears of true repentance. His way of life subsequently proved the sincerity of his conversion. Another unbeliever came to church at the very moment the people were enthusiastically exclaiming that the prodigy was being renewed. With great insolence he remained standing in front of the image. When he saw the Blessed Virgin's eyes move, he exclaimed, "I don't believe it!" and then left. Once outdoors, he retraced his steps, saw the movement of the eyes as he had the first time, repeated the same declaration of unbelief and left again. But something kept forcing him to go back to the church. This disturbed him, and he went in a third time. Grace triumphed over his obstinacy at last and he fell to his knees, weeping like a child. Many people who witnessed this miracle attested that when they saw it, they felt strongly moved by grace and drawn to the practice of virtue. Numerous conversions ensued. Shortly after the triduum, a novena was begun to ask for Our Lady's help on behalf of Ecuador. The prodigy of the eyes was renewed on three consecutive days and witnessed by many people. The Blessed Virgin in the picture moved Her eyes slowly. Then the background of the image faded and only the face stood out in relief. Its complexion was that of a living person. The Blessed Virgin opened and closed Her eyes. Twice She lifted them to Heaven. At times She seemed to be making an effort to hold back Her tears. Then Her face turned pale and waxen, as though She were about to die. Filled with dismay, the faithful burst into tears and cried out, begging for pardon and mercy. At last the face of the Blessed Virgin returned to its usual serenity and natural color. The same miracle took place in Riobamba with a reproduction of the holy image. Members of one of the leading families of that town and over twenty other persons, including the local president, saw Her eyes open and close very distinctly. As we mentioned above, the canonical investigation was conducted with all due gravity. Before the new Archbishop's appointment, the Vicar General had gathered all the witnesses, over forty in number, and explained the importance and magnitude of the written declaration they were about to sign. These declarations were to be made under oath before unbiased witnesses. The Commission of Inquiry also proceeded scrupulously in the scientific study of the event in question. Several commissions made up of men of science were formed; they were to establish whether any kind of natural explanation were possible. Physicists, chemists, photographers, physicians and theologians deliberated at great length. To avoid the slightest suspicion of partiality or self-interest, the Jesuits were not authorized to participate in these commissions. Calumniators did not fail to attack these proceedings and label everything as a hoax. Therefore, it had to be proven that there was no reasonable foundation to their critical allegations. 1. The event which occurred on April 20th in the Jesuit Fathers' Academy is established as historically certain. 2. The event, considering the circumstances in which it occurred, cannot be explained by natural laws. 3. The event, because of what preceded it as well as what followed it, cannot be attributed to any diabolical influence. And the decree adds: Consequently, it is permitted to believe in it. The faithful may render to the image that occasioned this event the public devotions permitted by the Church,  and pray before the image with legitimate confidence. To understand the declaration in the third paragraph in reference to what preceded the phenomenon, let us mention that this miracle had been predicted, though obscurely, by the Blessed Virgin Herself to a young girl of high virtue, well known for her supernatural gifts. Several days before the event, Mary had revealed to her that She intended to give a special sign of Her approval of the practice of children being raised by religious. St. Gabriel's Academy had reached a point of total decline. But then, in 1906, at the height of the anti-clerical era, the April 20th miracle occurred in the presence of the students and Fathers of the academy. The academy received a new lease on life, and from that day on it experienced a flourishing revival. 1. That earthquake, 8.3 on the scale, occurred on April 18, 1906; it almost entirely destroyed the city of San Francisco and took the lives of about 3,000 people. 2. Vuelve otra vez, Maria, Los maternales ojos, A los que aqui de hinojos, Te piden compasión. 3. Devotions permitted by the Church: that is, to honor, venerate and expose the image and pray before the image, which reminds us of the Mother of God and Her kindness. Those who oppose the cult of images or call it an idolatry are simply manifesting their ignorance. We are happy to display photos of our loved ones in our home or carry them on our person, to remind us of them and to prove our love. Can that be called idolatry?